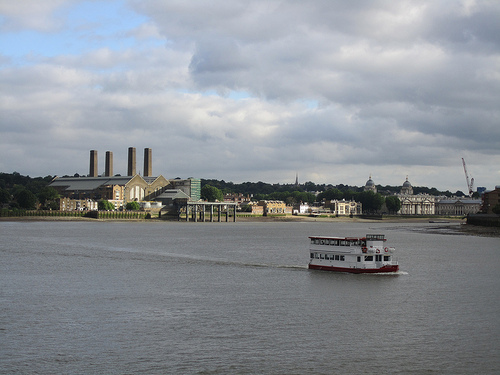 In the past few months, the Greenwich FROG have been looking beyond the key sites in Greenwich and thinking about the whole of the foreshore. 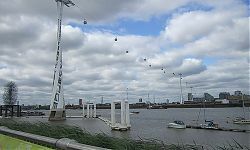 We began our expansion with a walk along the western half of the Greenwich peninsula, starting off in style, by taking a ride on the Emirates Airline from Royal Victoria Dock to the Dome. 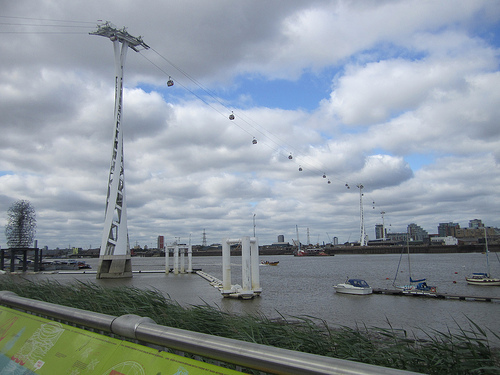 Once we had arrived on the peninsula, we headed towards the river, and followed the Thames Path west. We were on the lookout for any archaeological features visible on the foreshore, as well as trying to get a better sense of the historical development of the river front. We hit our first archaeology fairly quickly, and it was a massive surprise. We expected a lot of structures and remains relating to boat building and the other industries, and we found them just west of the Dome, with the remains of a large jetty and bargebed. But there was also something we hadn’t expected at all, a large section of peat, with submerged timbers, right up against the river wall. What we didn’t know then was that this was only the start. Five minutes later, a bit further south, we found several, even larger, areas of peat, all with timbers. During the walk, we weren’t able to get down to the foreshore, so this week, Courtney and I met at early o’clock one very grey morning to see if we could get a closer look (see photos below). Although I’d seen it from the river wall, and Courtney had seen the photos, I don’t think either of us expected to find what we did. There’s at least four large sections of peat, all of it relatively high up the foreshore, with preserved trees, branches and roots. We looked, but we only found a couple of possible worked flints and a small amount of burnt flint, so there was very little evidence for human activity. We don’t know much about this area in prehistory, so we’ve got a bit of research to do! Aside from the peat, there are many visible remains relating to the various industries on the peninsula: it’s definitely a walk worth doing, and now is possibly the best time! For the last few years, sections of the Thames Path have been shut because of redevelopment works, but it is all currently open. This may change, and certainly, a lot of the landside industrial buildings will be gone soon, as there are several new developments planned including a cruise terminal at Enderby’s Wharf and flats at Morden Wharf. If you want to do the walk yourself, there are several guides you can use. 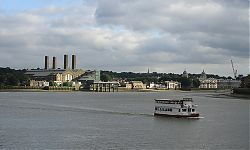 The Greenwich Industrial History Society, have one from 2002 online: many of the landmarks that were existing then have gone with all the recent redevelopment on the peninsula, but the history hasn’t changed, and it’s handy enough to print off. The original author of that walk, Greenwich historian Mary Mills, has recently started an blog about the history of the peninsula, including annotated chapters from her book Greenwich Marsh – The 300 years before the Dome, along with beautiful illustrations. Also earlier this year, the Viewfinder Photography Gallery launched their Thames Trail app, including historic photos and paintings of the peninsula and interviews with local residents and historians (including one with me about the foreshore in front of the Trafalgar Tavern!) It’s available for smart phones or as a booklet you can download here.